Tomorrow, August 25, 2016, is the 100th Anniversary of the National Park Service. Happy Anniversary, NPS! To celebrate its centennial, NPS is offering free admission to its parks for four days, from August 25 to August 28. That includes our own Pinnacles National Park. Whooo-hooo! Enjoy! 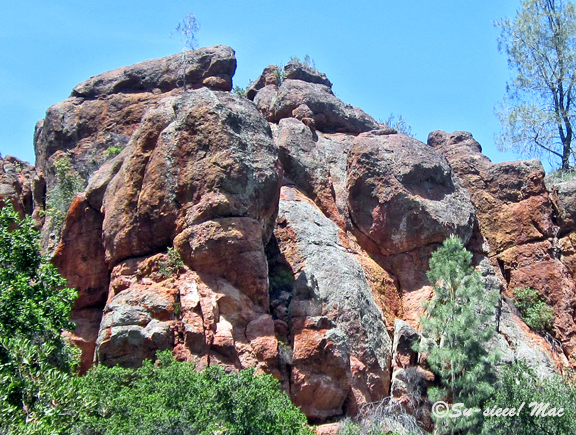 See the faces in these rocks at the Pinnacles National Park. Happenstance of nature or did some people of long ago start carving the faces? Interesting ponder, no? Have a great Sunday. See you tomorrow. 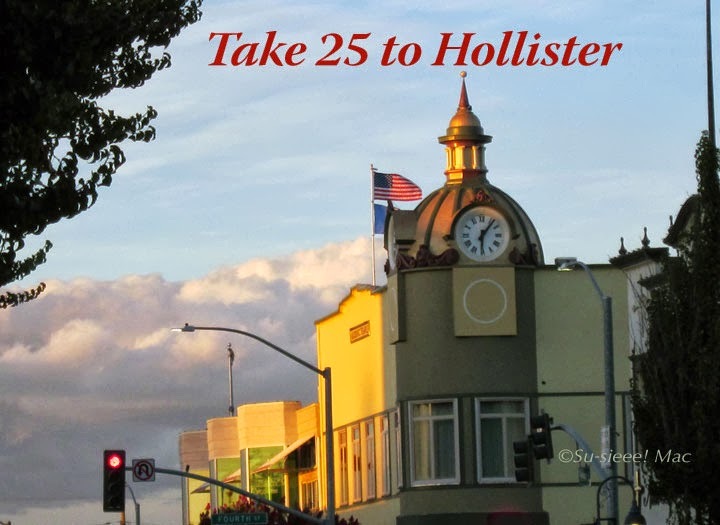 Today is another post from the Take 25 to Hollister archives. 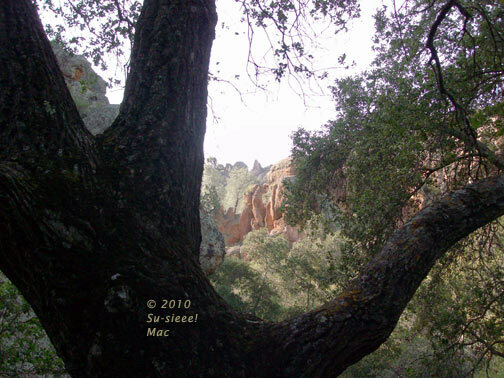 It's the first one I wrote about the Pinnacles before it became the Pinnacles National Park. FYI: The post is slightly edited for today. My mom loves to visit the Pinnacles. It reminds her of the Philippines. I don’t know if it’s the starkness of the mountains, the smell of the air, the feel of the breeze, or the way the sun warms your body as you trample along the trails. She’s never said. 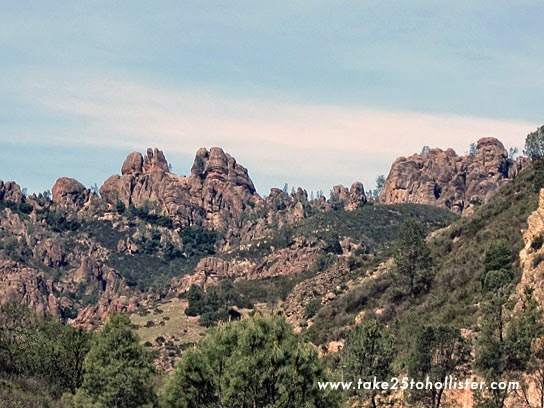 I just know that besides her gardens, the Pinnacles National Monument provides her with a sense of calm. 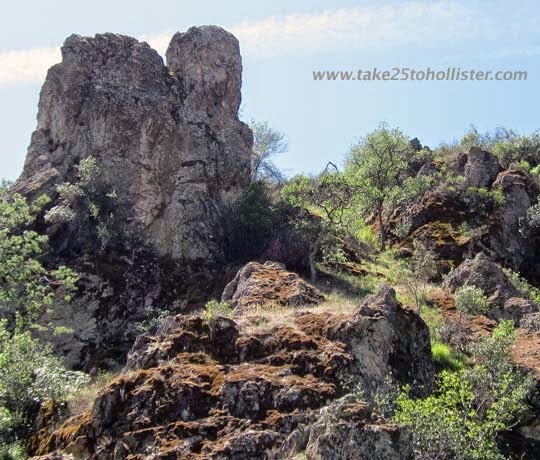 The Pinnacles is about 30 miles south of Hollister. It generally takes us (the Husband and I) about 45 minutes, but that’s because we are old farts who like to rubberneck the scenery. Not to worry. The traffic is sparse, but you do need to pay attention to curves the nearer you get to the park. You head south out of town on Highway 25. Depending on the time of day, we may stop at Flapjack's Country Café in Tres Pinos for breakfast. That’ll be a story for another day. According to the scientists, the Pinnacles is actually part of the Neenach Volcano that erupted waaaaay down south near Lancaster, California. The volcano was split by, yes, the San Andreas Fault. Over 23 million years, more or less, the Pinnacles was slowwwwwwwwly carried northwesterly to where it stands today. At the same time that it was inching up, wind and water carved out the spires and crags that someone in modern-day history decided to call the Pinnacles. Then President Theodore Roosevelt came along and established it as a national monument. This year, the U.S. National Park Service celebrated the monument’s 100th anniversary. Since 1908, it has grown from 5,000 acres to approximately 26,000 acres. (Thank you ranchers and rancher descendents.) The park service is currently developing a general management plan for the next 15 to 20 years. Public input is appreciated. You can do a lot of things at the Pinnacles. Depending on the time of year, you can scramble through talus caves, which are home to Townsend’s big-eared bats. But you can't go through 'em if the bats are there. You can bring your ropes and things and climb on the spires themselves. 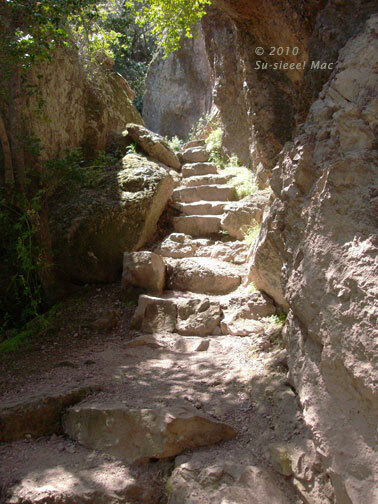 And of course you can hike easy paths and not-so-easy ones, which may make your hands sweat at certain HIGH points. If you’re lucky, you can see a California Condor or two circling above you. You can also hang out at a picnic table and enjoy the day, while the rest of your party are getting sweaty and tired. 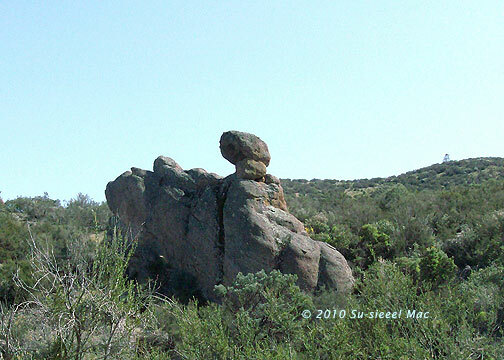 There are actually two entrances to the Pinnacles National Monument. The west gate is off Highway 101, near Soledad. You can’t drive west to east through the park. But you can easily hike through it. Camping is on the Hollister side only. Hmm, I think it's time to take out the hiking shoes. We are so fortunate to have a national park in our backyard. The Husband and I met up with friends last Sunday at the Pinnacles National Park. The east side, of course. By 10 a.m., the parking lot at the Bear Gulch Nature Center was full, so we took the free shuttle from the Visitor's Center. Too bad, there isn't a shuttle or a bus from Hollister. It would be a great way to enjoy the gorgeous scenery to and from the park. 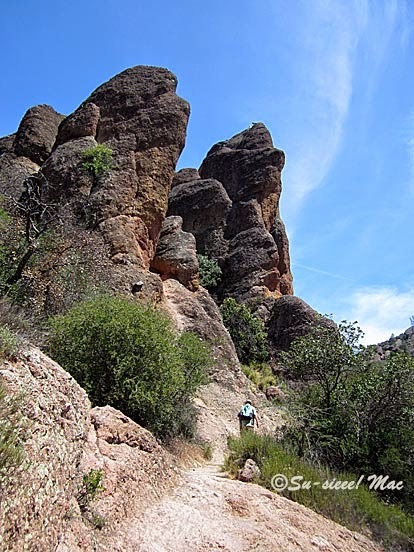 Here are a few photos of Pinnacles National Park from our hike. Enjoy! The eastern gateway to the Pinnacles National Park, that is. It's a not-to-well-known park (yet) about 30 miles south of Hollister. Formerly the Pinnacles National Monument, which was established in 1908, it was redesignated a national park in January 2013. Once upon a time, millions of years ago, the park was part of a volcano that once stood in present-day Lancaster in Southern California. 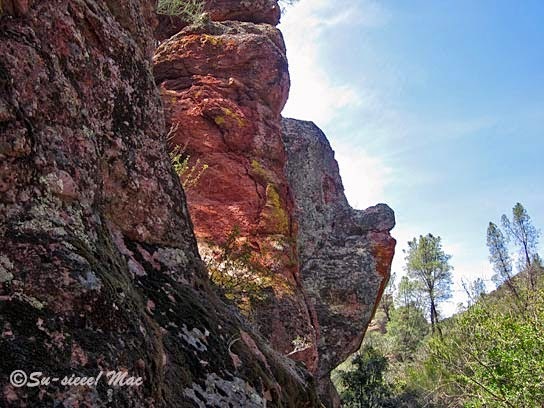 The beautiful, towering rock formations in the Pinnacles National Park are what it was named after. Those who hike the High Peaks Trail find themselves weaving among some of those majestic spires. The park has various easy to strenuous trails for hikers. 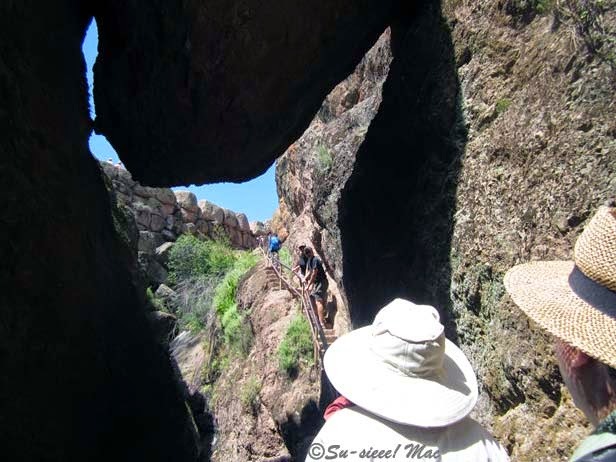 Visitors also have the opportunity to hike through talus caves when they are open. Rangers close the caves when the bats that live there are roosting. One cave houses a colony of Townsend's Big-eared Bats, while the other is home to a colony of Western Mastiff Bats. Want a chance to see a California Condor flying free in the sky? Head for this park. It's the only one in the National Park Service that participates in the California Condor Recovery Program. More than 30 condors, which were born and raised in zoos, have been released into the wilds of the Pinnacles over the last decade. There are two gateways to the park. No road connects the two. 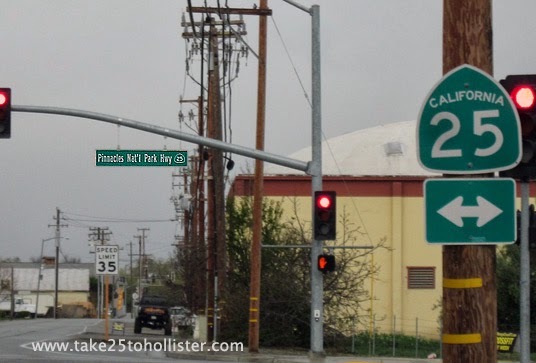 The eastern entrance is via Hollister, while the western entrance is via Soledad. Each side is gorgeous. I'm partial, of course, and like to go through the eastern gateway. 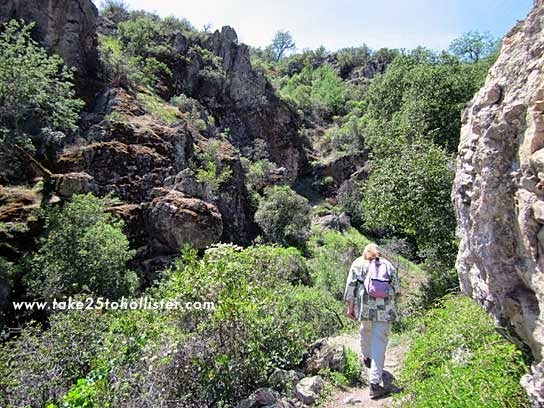 For more information about the Pinnacles National Park, visit its website. 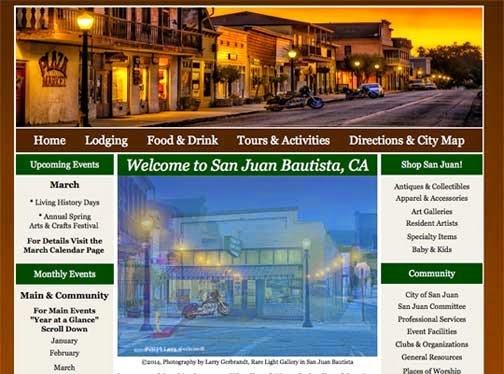 Are you looking for online resources to help you plan for a visit to Hollister, San Juan Bautista, the Pinnacles National Park, or somewhere else in San Benito County? The websites below are a good place to start. 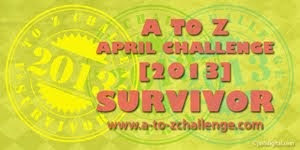 Click on the headings to go to the sites. 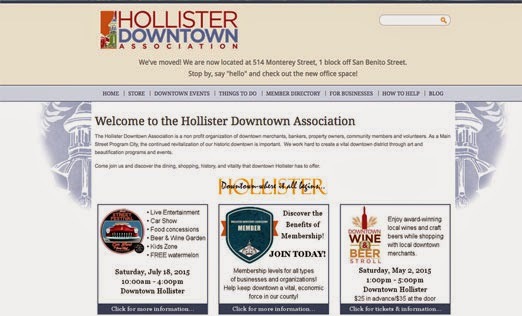 And, if you want to learn about some upcoming 2015 events in San Benito County, check out this link on Take 25 to Hollister. 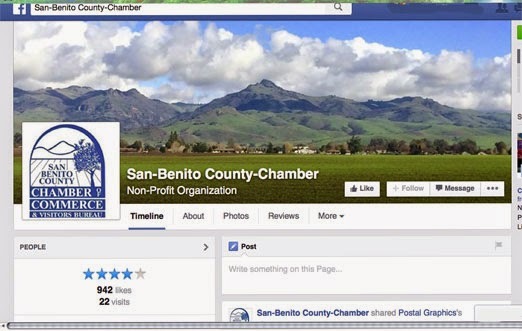 The Chamber of Commerce also has a website, but it was being redesigned when I wrote this post. It may be up now. Click here for its website. 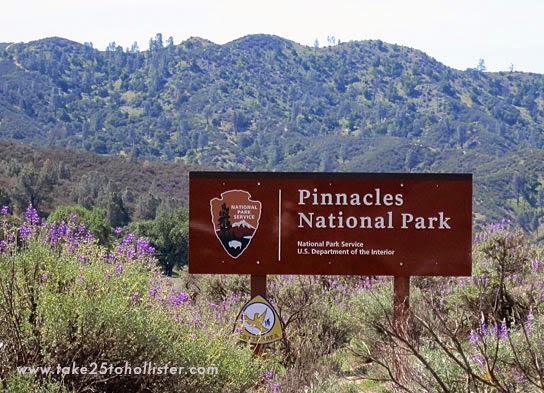 A definite must-do is a visit to the Pinnacles National Park. 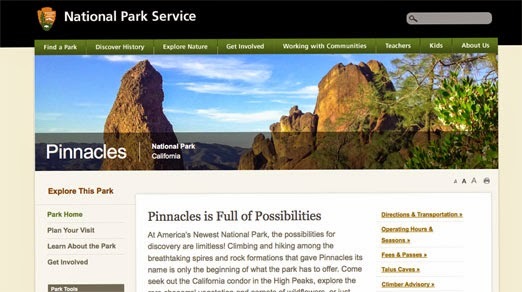 Although it is the newest park in the U.S. National Park Service, it has been part of the system since 1908 as the former Pinnacles National Monument. 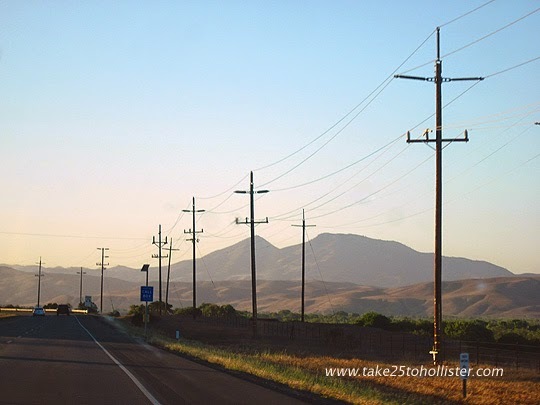 All of a sudden, there it was—the Pinnacles towering over the Salinas Valley. The Husband and I were driving north on Highway 101. The sun was on its way to setting as we passed by the ancient volcano. I've entered the Pinnacles National Monument, excuse me, the Pinnacles National Park, only a few times from the western side in Soledad. Even though there is no front or back sides to the Pinnacles, I think of the western entrance as the back way in. I wonder if some folks in Monterey County think the same way about the eastern entrance. According to Cambridge Dictionaries online, the definition of rock face is "an area of vertical surface on a large rock or mountain." 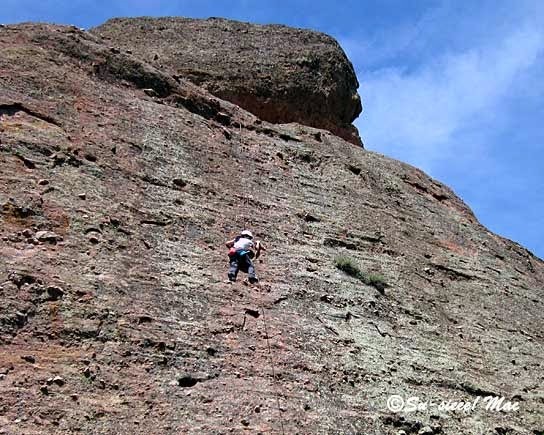 To me, a rock face is a face—eyes, nose, mouth, and so on—that I see outlined in a rock. 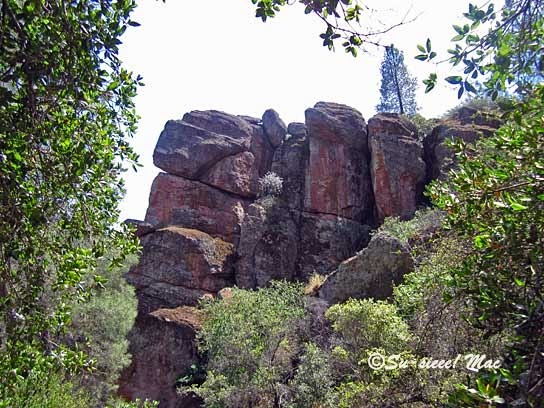 And, I see many rock faces in the Pinnacles National Park. How about you?